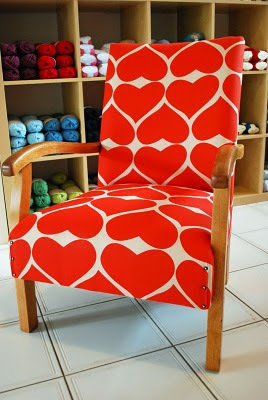 I have been coveting this chair for a couple of months now, ever since my friend Laura, half of the dynamic duo of Lismore-based chair lovers Fourish and Blume, emailed me a pic of it. They’ve just started a blog, documenting the transformation of their finds of musty old chairs and couches (nicked from the roadside or garnered from the iconic Lismore Tender Centre) into beautiful pieces like this. Little dynamos they are! While the process of transformation is fascinating, one of the most interesting things is the astonishing amount of stuff they find down the back of the chairs and couches - everything from ten dollar notes, pens and keys through to miniature plastic tennis rackets and embroidered kookaburras. Have a look at their brand new blog. 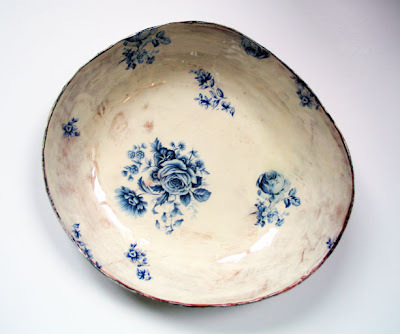 And this beauuuuuuutiful bowl from ceramic artist Maria Kristofersson (found via a plate a day). See more of her lovely work here. I love that plate too, it's such a great mix of handmade imperfection and polished decals. I was unsure if decals would look good on an uneven surface like that, but it's given me confidence to try!